That’s why they make ‘em run the races. Up until the middle of yesterday afternoon, Emirates Team New Zealand looked unstoppable after beating Land Rover BAR in the first race of the day to go up 3 to 0. Then, just moments after the start of Race 2, Kiwi helmsman Peter Burling submarined both of his bows and the team’s ACC50 pitch-poled, hurling half the crew into Bermuda’s Great Sound and possibly changing AC35 forever. Fortunately, none of the crew was hurt (bet they were glad to be wearing their helmets when things went sideways!) but at the very least, the fairing on the boat’s forward crossbeam appeared to be well and truly shredded, and who knows what may have happened to the internal workings of the boat’s wing. Same thing with the team’s mental state—especially Burling’s. Until yesterday the Kiwi’s seemed almost completely in control. From now on, though, they can’t help but have this incident the back of their minds, can’t help but sail in the knowledge that even the best-sailed race in the world can come to a crashing end in the blink of an eye. The monkey on this team’s back from the last America’s Cup, when they were on the losing end of one of the greatest comebacks in sports history, may have gotten some company—especially when the wind is up. In fact, Day 2 of the Challenger Playoffs were those most challenging, so to speak, thus far, with white caps on Great Sound and winds gusting in the low to mid-20s. Heaven help the Kiwis if they ever find themselves facing match point in these kinds of conditions again. We’ll see how they do later today. At press time, the forecast was once again for plenty of wind, which will mean having to get right back up on that horse, unless of course there’s too much wind and they get a postponement. [UPDATE: Wednesday&apos;s racing was eventually cancelled due to high winds, with competition set to resume on Thursday, June 8. On a side note, this was the second time in two days that a team has had to swap out a wing last minute due to damage (not to mention Artemis having to repair the shredded fairings on its crossbeams after yesterday’s heavy conditions). On Monday it was Land Rover BAR, yesterday it was ETNZ. Earlier, during the qualifiers, Oracle Team USA had to do an equally quick switchout of its rudder on race day. And who can ever forget the time Oracle trimmer Kyle Landford spent the second half of a race running back and forth to the wind effecting repairs while competing against Softbank Team Japan? As is the case with NASCAR and Formula 1, it’s beginning to look like the pit stops are becoming as big a part of the regatta as the racing. 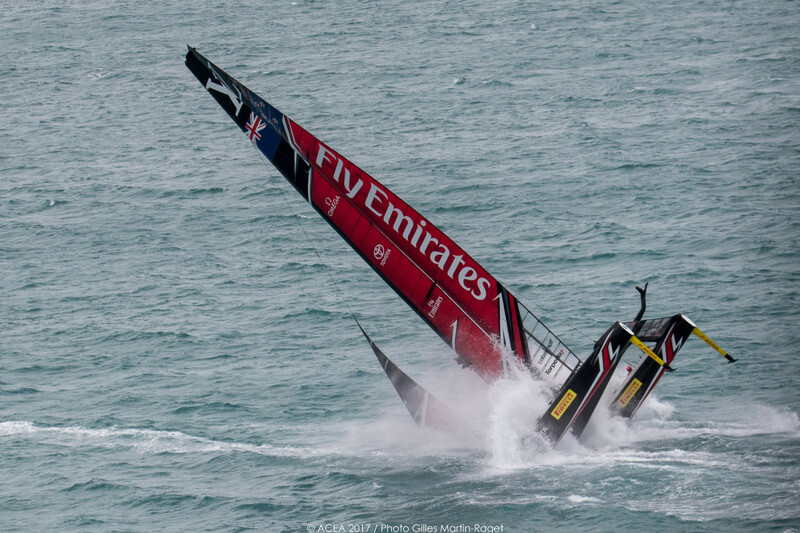 As for two teams grappling in the other first-to-five series comprising these playoffs, the roller coaster ride that has been the Artemis effort since Day 1 of the 35th America’s Cup took another downturn as the Swedish crew lost both races to Dean Barker’s Softbank Team Japan to fall to 1 and 3. Once again, the team seemed to get off on the wrong foot and never recovered, losing especially decisively in the second race of the day, thanks in no small part to a penalty the team incurred when it committed a boundary violation. Unfortunately, with two more races scheduled for this afternoon, Artemis could be booking tickets to take them back home by nightfall. But then again, you never know. That’s why they make ‘em run the races, and if there’s anything this latest America’s Cup cycle has been thus far, it’s unpredictable. On a final note: kudos to Land Rover BAR helmsman Sir Ben Ainslie. After seeing the competition going into the drink he did not exalt. Just the opposite, he first cautioned his crew to take it easy and then immediately directed his own chase boat to go to the Kiwi’s aid. A class act for a class sport. Makes you proud to be a sailor.